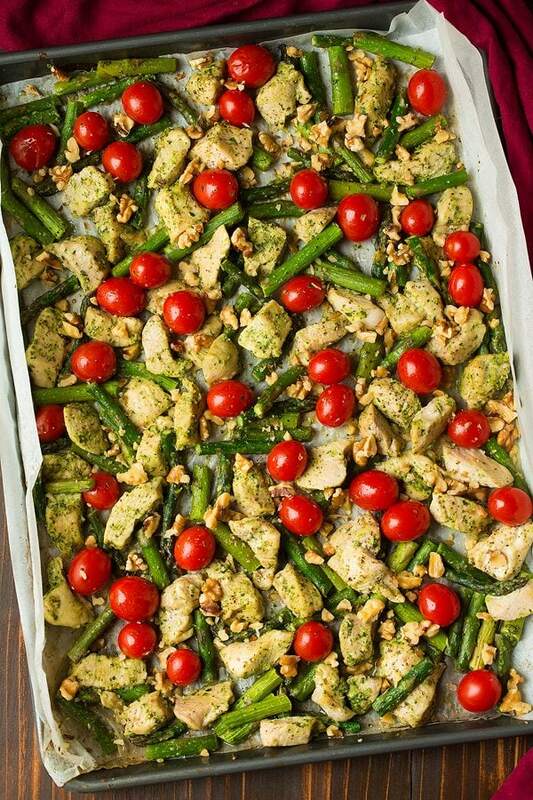 Pesto Chicken with Asparagus, Tomatoes and Walnuts is a simple sheet pan meal that’s brimming with flavor (thanks to al pesto). It’s so easy to throw together yet the end result is so delicious! This is a perfect weeknight chicken dinner, definitely a recipe you’ll want to hang on to. 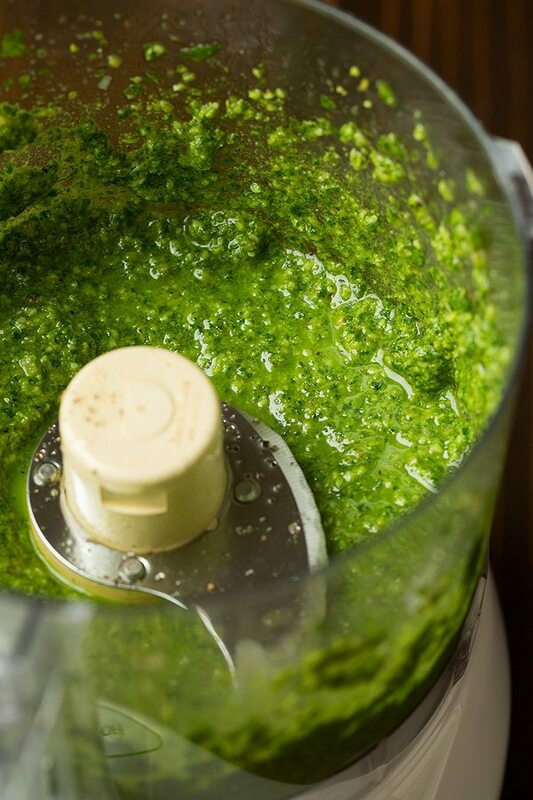 Homemade pesto makes any meal incredible doesn’t it? And it’s just so easy to make, the food processor does most of the work. 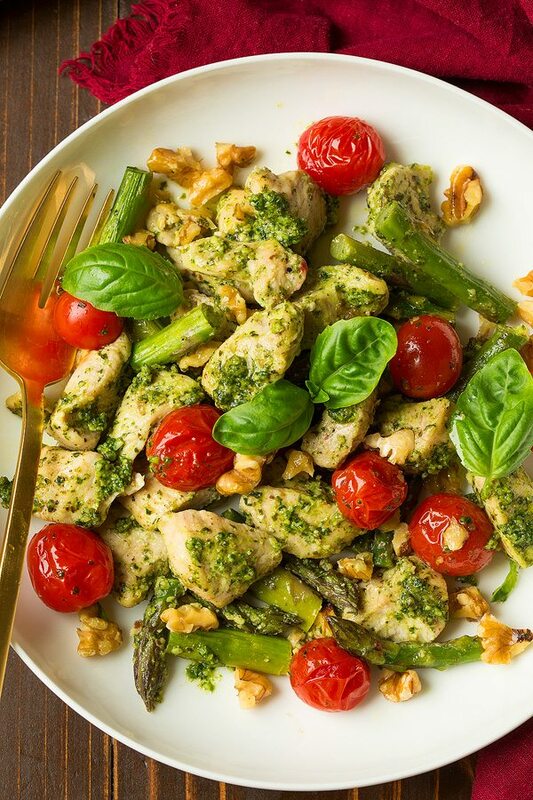 You get tender bite size pieces of chicken paired with fresh sweet tomatoes, nutritious asparagus, crunchy walnuts and it’s all covered with a super flavorful pesto. Here I like to cook the chicken with some of the pesto so the flavors have time to soak into the chicken, then I also like to add more at the end to get that really bright fresh flavor. Preheat oven to 400 degrees. Line a baking sheet or grease. Pulse basil, 1/4 cup walnuts, parmesan and garlic, with oil in a food processor. 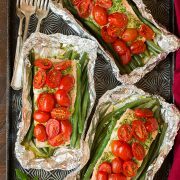 Place chicken and asparagus on sheet pan, toss with 1/4 cup pesto and S&P. Spread even and roast in preheated oven 10 minutes. Drain if there excess liquid then toss in tomatoes. Bake until chicken is cooked through, about 8 – 12 minutes longer. Toss with another 1/4 cup pesto and walnuts. One of the main highlights of this sheet pan chicken dinner (which we may not thick would be a highlight but they are) are those perfectly crunchy and buttery walnuts. I absolutely love walnuts! If I had to pick favorites it would probably be walnuts and pistachios. I eat walnuts almost everyday whether it be for a snack or as part of a meal. 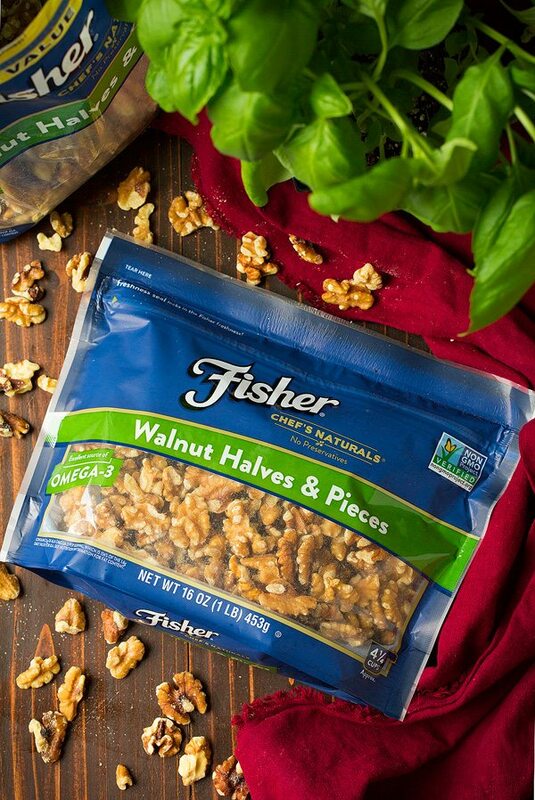 My go-to brand for walnuts is Fisher Nuts. I love that they are preservative free and salt-free, they’re heart healthy and an excellent source of those hard to find omega-3 fatty acids, plus I love that they’re just so tasty. Here I love the flavor and crunch they add to the dish, plus they make it just that much more filling. I also used them in the pesto as well, did you know you can always substitute the pine nuts in basil pesto with walnuts? They’re a cheaper alternative and they add the perfect nutty creaminess to the pesto. If you love pesto then don’t pass this recipe by! It is the perfect way to use up homemade pesto. 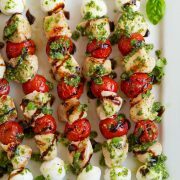 That combination of chicken, tomatoes asparagus and pesto is the perfect flavor blend. And don’t forget to freeze your homemade pesto when you garden in the summer and that basil is growing like crazy. Then just thaw it out in the fridge overnight and add to the recipe as listed. In a pinch you could also use store-bought pesto here, but obviously the flavors won’t be nearly as good – homemade takes the cake! 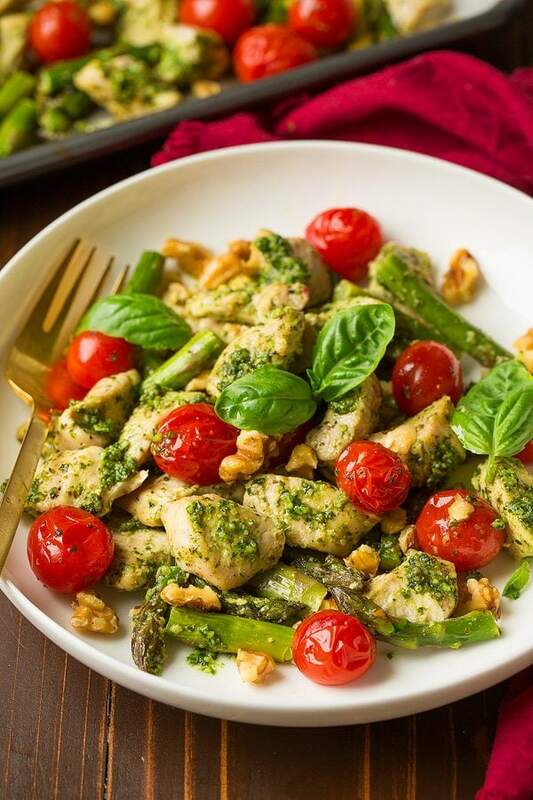 With this recipe you get tender bite size pieces of chicken paired with fresh sweet tomatoes, nutritious asparagus, crunchy walnuts and it's all covered with a super flavorful pesto. It's likely to become a weeknight staple! 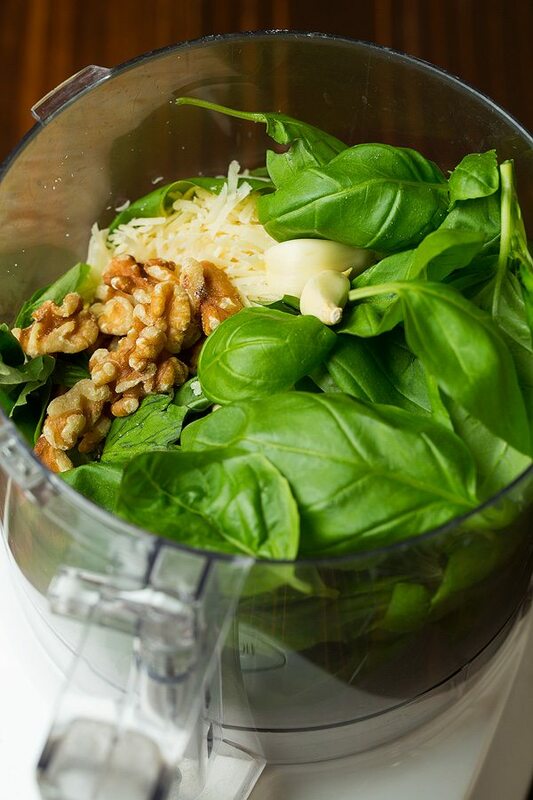 For the pesto, add basil leaves, 1/4 cup walnuts, parmesan and garlic to a food processor. Pulse until coarsely chopped. Add olive oil, season with salt and pepper to taste and pulse until everything is finely chopped and well combined. Set aside. Line a rimmed 18 by 13-inch baking sheet with a sheet of parchment paper or spray with non-stick cooking spray. Place chicken and asparagus on sheet pan, pour over 1/4 cup of the basil pesto. Season chicken and asparagus with salt and pepper and toss everything to evenly coat. Spread into an even layer (don't let chicken pieces overlap) and roast in preheated oven for 10 minutes. Remove from oven, carefully drain off excess liquid from one corner if needed (use a spatula as a guard to keep the ingredients from falling). Add tomatoes, toss everything and return to oven and continue to roast until chicken is cooked through (larger pieces should be 165 degrees in center), about 8 - 12 minutes longer. Remove from oven, spoon over another 1/4 cup of the pesto and toss (or just add the 1/4 cup to individual servings). Sprinkle in walnuts. 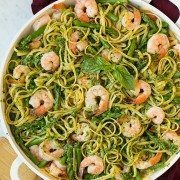 Serve immediately with more pesto if desired (or just reserve remaining pesto in refrigerator for another use - it can be frozen also). Paige Flamm: This chicken recipe looks amazing! I need this in my life!